When it comes to working on your car, few things are more important than having the right tools for the job. Sure, mechanical knowledge is also important, but the mechanically savvy can often improvise their way through an automotive repair relying solely on common sense and patience. The same can not be said for tools. Using inadequate tooling can lead to a number of problems in the garage, ranging from the frustration of wasted time and broken car parts to those of more paramount importance such as your safety and well being. While obviously annoying, a broken water pump or stripped oil pan bolt is easy to recover from by forking out a few bucks for a replacement. On the other hand, since you can be severely injured as a result of using unsafe tools and ignoring safety procedures, a successful recovery from an accident of this nature might not be so easy. One of the most important and ubiquitous tools found in most shade tree garages is the trusty floor jack. This is also probably the most frequent tool involved in safety related accidents due to the numerous pitfalls associated with their use that range from buying an inferior product that doesn’t live up to its safety claims to simple mistakes of improper use that could easily have been avoided. But fear not, for this buyer’s guide will walk you through all the steps necessary to choosing the right floor jack that is both high quality and suitable for your type of car. In addition, basic car jack safety protocol will be discussed so you can use your jack safely. Below is a quick reference table designed to give you quick and easy comparison before we dive too deep into the article and reviews. The table consists of the makes and models of some of our favorites, as well as relative price and average rating. If you want a more in depth look feel free to skip ahead. However, if you are just looking for a quick recommendation, this table is for you. So before we get too much deeper, let’s take a minute to define exactly what a floor jack is. A floor jack, often also referred to as a car jack, auto jack, or garage jack, is a mechanical device designed to give the user the necessary mechanical advantage to lift heavy loads. 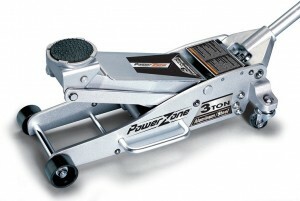 Although floor jacks have a variety of uses, the vast majority of uses pertain to lifting automobiles or trucks. Floor jacks employ a variety of mechanisms to impart lifting force: most often these mechanisms include hydraulics and lead screws. When/Why Do You Use a Floor Jack? Now that you know what a floor jack is, let’s talk about some of their possible uses as they relate to the automotive world. Most auto mechanics ranging from amateur to professional will at some point find that they need additional ground clearance when working on their car in order to provide better access to various components. By far the most common instances are lifting a car to gain access to the oil pan drain plug during an oil change and lifting a car to allow removal of the wheels during a tire rotation. Other common procedures include changing brake pads and rotors, transmission work, suspension work, and exhaust work. 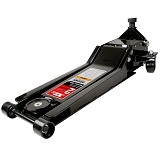 In addition to lifting the car itself, floor jacks are often used to lift only the motor in order to provide additional clearance within the engine bay. An example of when this would be necessary is during an engine mount replacement procedure. 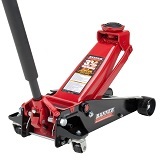 The hydraulic floor jack is the most instantly recognizable variant of the floor jack, and is the type that most mechanics gravitate towards due to their convenience. A hydraulic floor jack typically consists of a trolley with four wheels that houses a hydraulic cylinder. This cylinder raises and lowers a lever arm with a small platform that interfaces with your car or truck. Hydraulic floor jacks usually have a detachable lever that is pumped in order to actuate the lifting mechanism. The advantages of this type of jack are they they are extremely easy to use as they do not require a substantial amount of physical effort to lift a vehicle. In addition, they also often have a very high maximum height which allows you to lift your car higher off the ground than with other types of jacks. The wheels on the trolley also aid in keeping the jack properly positioned underneath the car as you lift which helps to eliminate jack lean and makes for an all around safer jack. The only disadvantages of this type of jack are cost and the fact that they can be rather heavy and sizable which means slightly less portability than other types of jacks. A scissor jack is actually provided with many automobiles right from the factory. These jacks are typically light weight and space efficient, which is why auto manufacturers choose to place them in the trunks of cars for swapping in your spare tire on the side of the freeway in the event of a flat tire. They consist of a lead screw that compresses a scissor linkage to gain elevation. This type of jack typically has serious limitations in height as well as lifting capacity due to the fact that they are designed to be so compact. These jacks work great in a pinch, but will only get your car high enough off the ground to change a tire. It’s unlikely that a factory provided jack that’s buried away in your trunk will have the height to do more involved car repairs such as transmission work as they won’t get high enough to allow the space for a human to slide under the car (read more about climbing under the car below in our floor jack safety section). This type of jack has existed for a long time, but most people tend to find hydraulic floor jacks to be more convenient for garage use. Much like a floor jack, a bottle jack is hydraulically operated. It consists of concentric cylinders that provide stiffness that are actuated by hydraulic pressure that results from pumping a lever, much like a normal floor jack. The major advantage of these jacks is their small footprint. If you are working with limited space or on uneven surfaces (which is ill-advised), the small footprint allows a bottle jack to be more stable in some situations. Their downside is that they have a very high free height, meaning that they don’t get nearly as low as a scissor jack or regular floor jack when fully compressed. This makes them difficult to use on lowered cars and even many sports cars and sedans at normal ride height. As such, they see the majority of their use when lifting trucks, since ground clearance issues aren’t as large of a concern. It should also be noted that bottle jacks generate the highest lifting capacity value when compared to other types of jacks. Obviously the most important thing when using a floor jack, or when doing any type of work on your car for that matter, is your personal safety. A little common sense goes a long way, but there are some facets of safety that may not be so obvious. To guide you, below is a list of some basic safety principles and tip for using your floor jack. 1. Never trust your floor jack to support your car by itself. Always use jack stands. Any mechanical component ever designed can theoretically fail, but mechanical components designed to move tend to fail at a higher rate. A floor jack falls into the latter category. It has been well documented that hydraulic floor jacks can and will fail over time due to wear on the hydraulic components. Unfortunately this mode of failure is rather innocuous because instead of a catastrophic failure, the jack will slowly let the car down. While one would think that this would be an advantage to someone in danger of being crushed, it really isn’t. Often times the slow descent during a failure goes unnoticed for the few precious moments a person has to escape. Keep in mind that a person on their back underneath a car has limited speed and agility to get out of the way as well. But there’s good news! This problem is extremely easy to avoid by pairing your floor jack with a set of high quality jack stands. Once you raise your car with your jack, place a pair of jack stands underneath the car and rest the car on them instead of relying on the hydraulic components of your jack. Only after you have supported your car with jack stands should you ever climb under to do any work. It is also recommended that you rock the car a little bit by hand near the top to ensure that your setup is sturdy before you climb under. While it would be bad to have your car fall off a poorly placed jack stand when you give the car a little test shake, it would be much worse if it fell on you because you didn’t. You may also consider using chalks if you are only using two jack stands in order to prevent your car from rolling. As an added measure of safety, you may also place a wheel that you removed under your car for added safety (although this should only be used in addition to a sturdy jack stand, not as a replacement). 2. Always raise your car on level ground. It is never a good idea to raise your car on any terrain other than that which is level. Resting your jack or jack stands at an angle as a result of an uneven floor creates a tipping hazard as the car can easily go over center relative to your jack and fall. The most common occurrence is when someone tries to lift their car on a slanted driveway. For much the same reason you shouldn’t use a forklift on a hill, you shouldn’t use your jack on any kind of slope. 3. Raise and lower your car slowly. Raising and lower your car slowly allows you to identify any problems before they happen, thus hopefully allowing your to prevent them. In addition, lowering your car too quickly can lead to several scenarios where damage to your car can occur. When operating your jack either up or down, it’s best to use slow and controlled movements. 4. Use appropriate jacking points on your car. This cannot be stressed enough. Your car has very specific points where the frame has been reinforced to support the load of the car when raising it with a jack. These locations are always lined out in your owner’s manual for your car as well as often times well marked on the car itself. Do not lift a car under any circumstances unless you are confident that you are jacking the car up from an appropriate location. 1. Consider what type of car or cars you will be using the jack on. The type of car that you are using your jack on plays an important role in helping you choose which jack to buy. The most important factor here is ground clearance. Ground clearance is defined as how high off the ground your jack point (the place where your jack contacts your car when lifting) sits. Cars with low ground clearance typically are easiest to lift with normal hydraulic floor jacks. In fact, jacks in this style can be had in “low-profile” options for particularly cars, such as lowered performance cars, sports cars, and race cars. 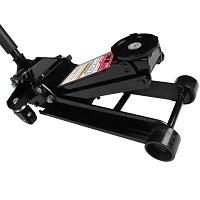 They hydraulic floor jack is also a favorite for most sedans, SUVs, vans, coupes, and trucks. If you have a particularly high car, such as a lifted truck, you might find a bottle jack to be more suitable. If your goal is just to toss the jack in your trunk for emergencies, then a scissor jack is ideal due to compact size and low cost. That said, a hydraulic floor jack will be suitable for most people and most cars, so if you can’t decide your best bet is to stick with a hydraulic floor jack. 2. Consider the weight of your car. All floor jacks are rated to a certain maximum weight capacity. You must be diligent about making sure the maximum capacity on the jack you want to purchase exceeds the amount of weight you intend to lift with it. Typically this rating is provided in tons, with 2 ton jacks and 3 ton jacks being the most common. It’s important to remember that your jack will never support 100% of the weight of your car. The worst case is lifting near the engine, where it is likely to support a maximum of roughly 60% of the weight of your entire car. That said, a general rule of thumb is that most sub-compact, compact, and economy midsize cars can be safely lifted with a 2 ton jack. For luxury midsize cars, full size cars, suvs, vans, and trucks, a 3 ton jack is suitable. If you have a particularly heavy or large car, you may have to jump up to a 3.5 or 4 ton jack (or bigger), but this doesn’t apply to most cars. 3. Consider the build quality. Like with any investment, it pays to do your due diligence up front when it comes to buying a floor jack. Long term, a high quality floor jack will cost you less than buying a poorly made one and constantly having to replace it do to failure. Sure, you may be attracted to the cheap cost up front, but when you compare the cumulative total that you would spend if you have to replace a few poorly made jacks, you’ll rarely come out ahead if you buy the cheapies. To identify a jack with superior build quality, the best thing to do is to pull it out and look at it if you can. A well built floor jack will have predominantly metal parts, whereas a cheap one will have many plastic components. In addition, the quality of finish is often an indicator of material quality. If there is lots of brushed or polished metal with some nicely painted/coated sections, this can mean that a manufacturer is trying to show off their components. Conversely, if paint is sloppily piled on to every component indiscriminately with visible overspray, a manufacturer might be trying to hide inferior quality metal. In addition, a high quality floor jack will be heavy and will operate smoothly. There should also be no leaks. Of course, since not everyone has the ability to actually inspect a jack when buying online, reviews become like the ones below become critical in evaluating quality. The Arcan 2 Ton jack is absolutely superb (as is every Arcan jack we’ve tried), and is our first choice when it comes to picking a top of the line floor jack. It is a high quality all aluminum construction which makes it strong but light, weighing in at only 49 pounds. It’s low profile construction allows it to effortlessly slip under cars with as little as 3.5″ ground clearance. It will raise to a maximum height of 19.25″ off the ground. It is easily stowed due to the quick locking two piece handle that can be broken down in a matter of seconds. In addition, this two piece handle allows for quite a bit of leverage when pumping the jack, so it takes very little strength input to raise a car. The jack has two front casters that are fixed, and two swivel casters in the rear which make it easily maneuverable, even in tight spaces. It has a rubber pad atop the saddle which serves to protect your vehicle by preventing contact with the metal parts of your jack. The Arcan 3 Ton also takes only 12 pumps to achieve maximum height, which decreases the time you have to spend lifting your car. Another nice feature is the side mounting handle that allows for easy carrying and repositioning of the jack when working on your car. Last but not least, it’s anodized in clear so you can really see the beauty of the high quality aluminum! Realistically this professional quality jack is a steal in the low 200 dollar range. All in all, this is a phenomenal jack that is worth your consideration if you have the budget. It should be noted that Arcan also makes a comparable 3 ton version which we have the same affection for. You can see the 3 ton version here anodized in blue: Arcan ALJ3T. If you don’t happen to want to spend the amount of coin required for the Arcan reviewed above, Powerzone makes a great high quality mid-range option. The Powerzone 380044 is almost all aluminum construction and tips the scales at 59 pounds, which is just a shade higher than the 3 ton Arcan mentioned above. 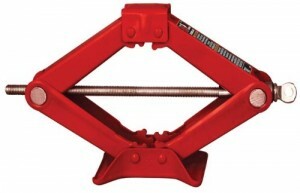 The jack’s capacity is 3 tons with a lifting range from 4″ at the minimum height to 18.25″ at the maximum height. The Powerzone has a split padded handle which allows the user to easily generate the leverage required to lift an automobile while still making the jack extremely easy to stow when not in use. The front casters are fixed and bidirectional whereas the rears swivel, allowing quite a bit of freedom to move this jack around. Another nice feature that this jack possesses is the rubber pad to protect your car against damage. Feature for feature, this jack hangs right with the Arcan’s 3 ton offering. However, when it comes to the matter of build quality, some minor compromises are made compared to the Arcan to make the price more affordable in the mid 100 dollar range. But don’t let this comment lead you astray, the fit and finish as well as the craftsmanship are great. 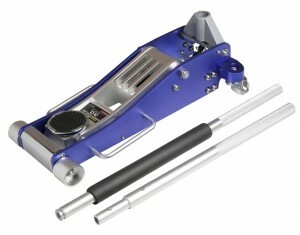 As far as features for price, we consider this jack to be the best floor jack for the money. It has all the features of the nicest jacks but at a price that’s a little more attractive for someone who just wants a great jack with no frills. In addition to Arcan and Powerzone, Torin is one of the top floor jack manufacturers around. Their 2.5 ton racing jack is fantastic and certainly worth considering. The biggest reason to get this jack is that it takes very few pumps to reach max height. 7 pumps to be exact. This jack is perfect for working on your car when time counts. If you take your car to the track and have only a limited time to replace your tires or fix a problem underneath you car, you will be happy you have this jack. The minimum lift height is 4.125″, and the maximum is 18.25″ when fully extended. It should be noted that the saddle is removable so you can get some spare room on the bottom end should you need it. The construction is steel and aluminum, with well protected hydraulics that are sure to last quite a while. The jack is sturdy, employing fixed casters up front and rotating casters in the rear to allow for easy mobility and positioning. It is also reasonable in the weight department, and has a handle to help with portability. Torin is well regarded in the automotive community for their high quality and quality is evident with this particular jack. Lastly, on a somewhat subjective level, we think the contrast between the black and bare metal make this jack the best looking of the bunch we have reviewed. Overall the Torin 2.5 Ton is a great tool that won’t break the bank, coming in at a very reasonable price point. In addition to making hydraulic jacks, Torin also makes scissor jacks. The minimum height on the T10152 is 3.75″ and the maximum height is 15.4″ at maximum extension. Overall the construction is good. The lead screw actuates smoothly and the base remains level and firmly planted to the ground. The jack is relatively compact, so despite it’s lower capacity and maximum height compared to its hydraulic couterparts, it does the job nicely. As a result of the size, this jack is easy to store in your trunk should you need to. Perhaps the biggest advantage to the Torin 1.5 Ton is the fact that it’s super cheap, costing less than a fifth of what the hydraulic jacks cost. Be warned though that it takes considerable time to lift your car using this type of jack because you will have to turn the lead screw many revolutions before reaching maximum height. It should be noted that this type of jack also has application when it comes to trailer leveling with respect to campers, RV’s, and towing in general. Overall, if you are willing to sacrifice some convenience to save cost, this jack is awesome and it’s just what you’re looking for. Yes, you read correctly. 8 tons. 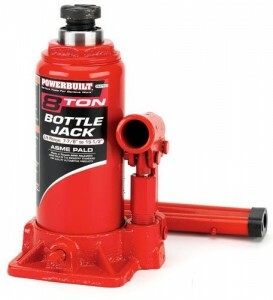 The great thing about the Powerbuilt 8 ton bottle jack is its huge lifting capacity. 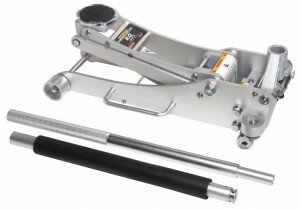 This jack has a lifting range from 7.88″ to 15.5,” making it ideal of trailers, campers, and trucks. You will need an ample supply of ground clearance to clear this jack. It’s simply not going to fit under your classic Camaro or your Toyota Corolla. If your vehicle fits into the niche that would require a jack like this, this one is fantastic. Aside from the high capacity, this jack boasts excellent build quality and relatively minimal pumping effort. It also features an extension screw that can be turned before lifting your automobile for added height. You should take note that this jack doesn’t have wheels, so place it where you want it as it won’t roll itself into position like other types of floor jacks. As a result of its lack of wheels, it has a very small footprint of roughly 5″ x 5″ and is very sturdy. At the price point, you really can’t go wrong. So congratulations for making it all the way through the article, because now you are an expert when it comes to automotive jacking devices. Hopefully you have found this guide to be helpful! While any of the jacks listed above are recommended wholeheartedly, it should be noted that there are many other great floor jacks out there too. If none of the above speak to you or you don’t quite see your flavor, have a look at a few more by clicking here to see more types, read more reviews, and get a feel for prices. And remember, no floor jack is safe without a great pair of jack stands to go along with it.